Charles Mann scored on a layup through traffic in the lane with just 17 seconds left to lift the Georgia men’s basketball team past Ole Miss, 75-73 Friday night at the Georgia Dome. The Bulldogs, who entered the tournament as the No. 3 seed with a double-bye to tonight’s quarterfinal round will face Kentucky tomorrow in the semifinals at approximately 3:30 p.m.
“That’s a really hard fought game,” said head coach Mark Fox. “It’s March Madness and we figured it would be a battle. The last two times we played Ole Miss, it came down to the last second after 40 minutes, and this one was no different. Mann led Georgia’s four double-digit scorers with 16 points. Marcus Thornton contributed nine points and 11 rebounds. In the second half, neither team led by more than four points and the lead changed 13 times. The Bulldogs outrebounded the Rebels 26-to-18 in the second half and shot 75 percent from the charity stripe. Ten of the game’s final 14 points were scored from the free throw line. In the first half, the Rebels jumped out to an early 18-7 lead, but Georgia responded with a 16-6 run, largely supported by two three-pointers apiece from Kenny Gaines and J.J. Frazier, to cut the Rebel deficit to one, 24-23, with nine minutes remaining. The Bulldogs grabbed a 33-29 lead—its largest of the game—with just three minutes left in the half, but the Rebels thwarted the Georgia advance with a 6-0 mini-run to eventually take a 38-36 halftime lead. 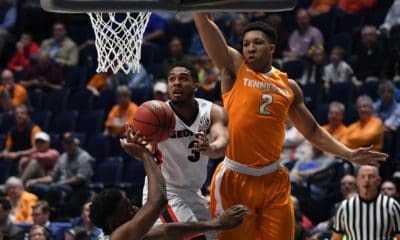 With four starters getting in foul trouble in the early part of the first half, Frazier scored eight of his 11 points in the half, helping Georgia fight off multiple Ole Miss offensives. A total of 51 fouls were called in the game—a total reached just twice throughout the entire season. 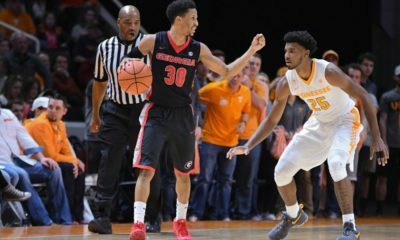 The game’s 73 free throw attempts were the second most of any Georgia game this season. Ole Miss was led by Jarvis Summers who scored 26 points. Marshall Henderson scored 19, but went 2-for-16 from three-point range. Georgia improves to 8-2 all-time when facing Ole Miss in the SEC Tournament. Ole Miss is now the fifth SEC opponent that Georgia has beaten twice this year. 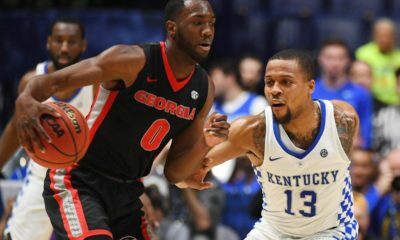 Georgia will face Kentucky on Saturday at approximately 3:30 p.m. The game will be nationally televised on ABC. Earlier this season, the Wildcats won the only meeting between the two teams, 79-54 in Lexington. • Georgia’s starting line-up was Marcus Thornton (57th career start), Brandon Morris (42nd career start), Charles Mann (37th career start), Kenny Gaines (29th career start) and Donte Williams (89th career start). • Georgia has won five of its last six games. • With tonight’s win, Ole Miss becomes the fifth SEC team that Georgia has beaten twice this season. • The Bulldogs improve to 18-4 when outrebounding its opponent. The Bulldogs actually faced a seven-rebound deficit at halftime, but was +8 in the second half. 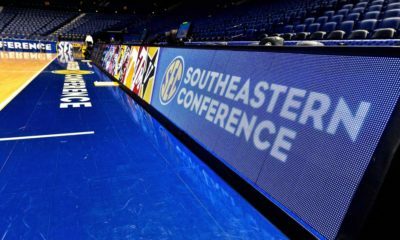 • Georgia is now 4-4 in the SEC Tournament in the Mark Fox era. 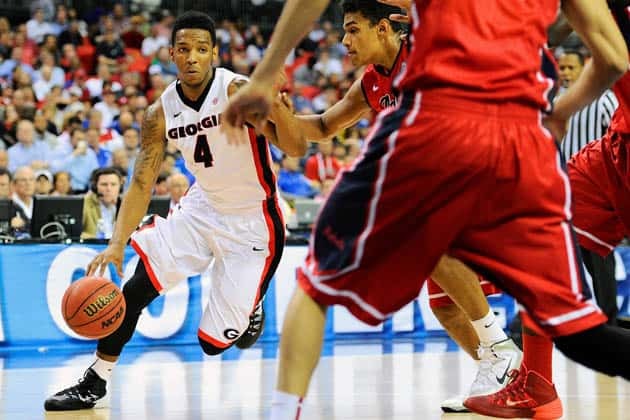 • Georgia held Ole Miss to just 2-for-25 (8 percent) from three-point range—a season best. • Dating back to March 7th, UGA teams have now won 24 consecutive head-to-head competitions in seven different sports. The Series: Georgia improves to 68-40 all-time against the Rebels, including 8-2 in SEC Tournament games. Ole Miss is the fifth conference opponent that Georgia has beaten twice this season. Next Up: Georgia will face Kentucky on Saturday at approximately 3:30 p.m. The game will be televised on ABC.